You may remember that way back in March, we announced that Chrome Industries (makers of those ubiquitous messenger bags) had a new SPD shoe. 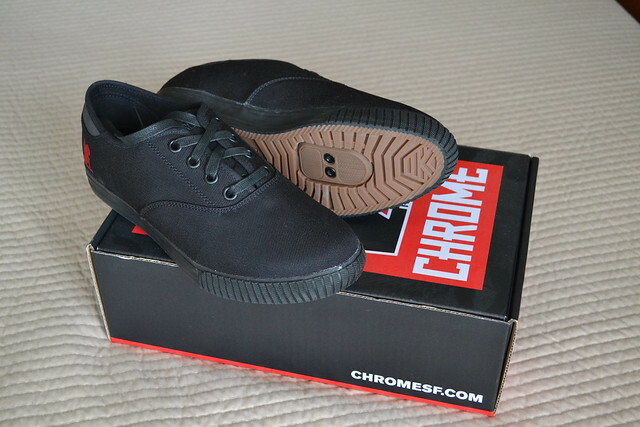 After that announcement, Chrome generously sent us a pair to review. I’ve been riding them for several months now and want to present my thoughts on them. Style-wise, Chrome shoes tend to evoke “classic” footwear…shoes that resemble Vans, or perhaps Converse Chuck Taylors. The Truk Pro shoes, at least to me and to several of my cycling friends, vaguely resemble the classic Keds of the 70s and 80s. They have a similar tapered toe shape and unembellished look, much like those Keds. Some others, however, thought that Chrome dropped the ball in the styling department with the Truk Pro. My wife was not a fan and remarked that they look like “orthopedic ‘old folks shoes'”. Ouch. To each their own, I guess. 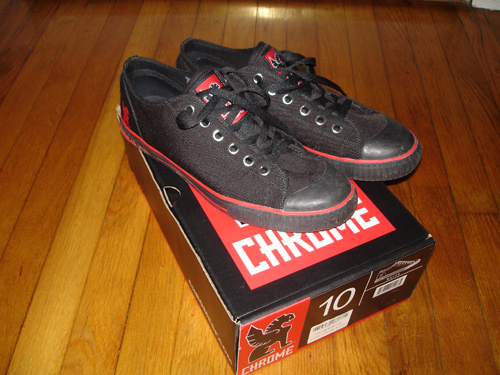 Back when we reviewed Chrome’s Kursk shoes, we remarked on the amazing durability of the 1000 Denier Cordura fabric. That same fabric makes an appearance here, and it is every bit as bombproof. The material shrugs off abrasions and stains and keeps on looking good. Unlike the Kursk shoes we reviewed a couple years ago, the Truk Pro comes with removable sole plugs to mount most two-bolt cleats for many clipless pedal systems. 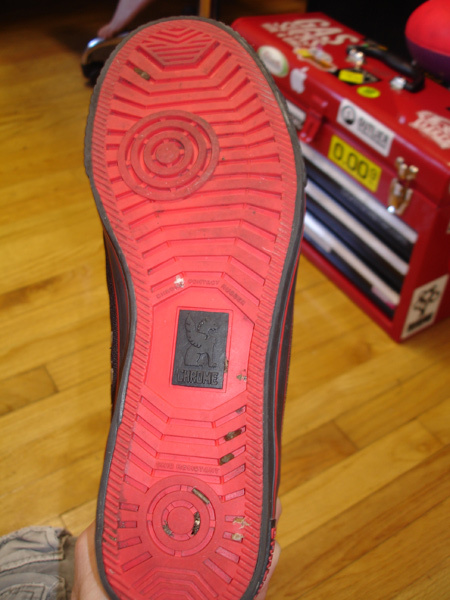 The sole plugs are held in place by two cleat bolts and no cutting is required. If you don’t want cleats, leave the plugs in place. The cleat mounting holes are in a good location and offer the user plenty of adjustment fore/aft and side-to-side. I mounted Shimano-style mountain SPD cleats (my preferred pedal interface both on-and offroad) with no issue. The Truk Pro pedals rather efficiently; the sole is stiff enough in the right places to offer a benefit without being too stiff to walk in. The cleat pocket recessed my SPD cleats enough to minimize contact with the ground, so there are no worries about chewing up your hardwood floors or breakroom linoleum should you wear them to work. 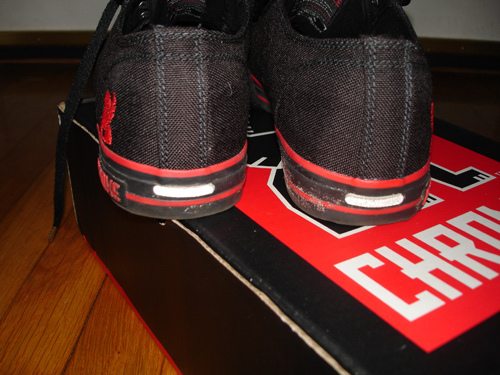 The insole is cushy, and the shoe itself is comfortable for all-day wear. In my experience, the overall fit was a bit of an issue. Normally, I wear size 10s in most brands of shoes, with the occasional 9.5 thrown in. 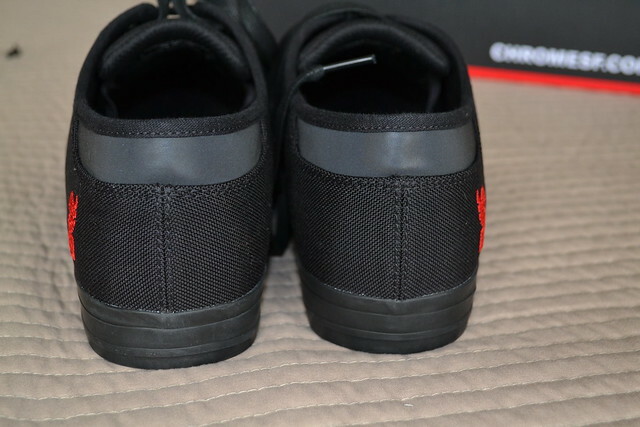 The Truk Pro pair I reviewed was size 10. The foot part felt the right size…but the heel cup just doesn’t work for me. I experienced a bit of heel lift when walking unless I cranked the laces really tight, and still my foot sloshed around toward the backs of the shoes. It might be a good idea to try a pair on, if possible, before purchase. I am hesitant to suggest that you order a half-size down, but in my case, I think that may have helped. According to Chrome’s website, the shoes come in half-sizes from U.S. 4.5 all the way through 11.5, and whole sizes up to U.S. 14. The Truk Pros come in black or grey. Overall, I liked the Chrome Truk Pros. They are subtle enough for daily wear in casual work environments, they do a fine job whether walking or pedaling, and they are supremely durable. 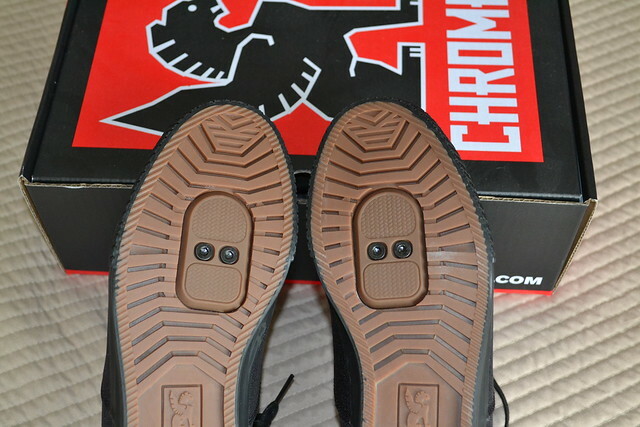 Priced at $95.00 USD, that’s not a bad price for quality footwear with the features Chrome offers. Just check the sizing, if possible, and ride on! Check out Chrome’s complete lineup of bike bags, apparel and footwear by visiting their website. Several months back, the wizards behind the wildly popular Chrome messenger bag line announced that they would be coming out with several models of shoes, all named after famous WWII battles. Fast forward a couple months and they sent RL a courtesy pair of their “Kursk” shoes to try out. With RL’s beefy physique and matching wide feet, those shoes just didn’t fit, so he passed them over to me. The Kursk shoes are very reminiscent of the classic Converse All-Star, which has long been very popular for urban riders of all stripes. Right off the bat I’ve got to say that Chrome took the general styling of those classic shoes and made them WAY better. First, the construction — the shoes are made of lightly-padded Cordura nylon and vulcanized rubber. The Cordura is incredibly durable and blows traditional canvas away. It doesn’t stretch, it doesn’t rot and it shakes off a ton of abuse. Same with the rubber toe cap and bumpers on the Kursk shoes — despite some heavy riding and daily kick-around wear, these shoes still look new. Second, the details — this shoe has several features that make it ideal for urban riders. I especially like the “lace garage”, a loop of elastic that holds the tied laces parallel to the sides of the shoe. No more annoying (and dangerous) windup from a loose lace getting caught in your chain! 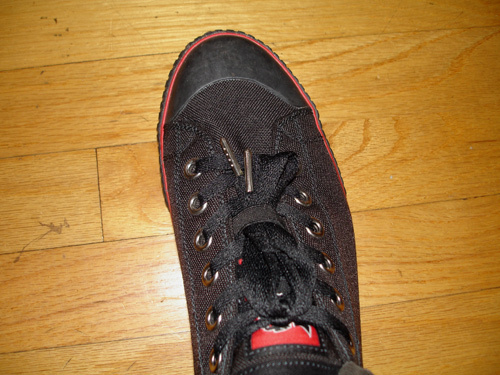 The laces have steel aglets (endcaps) to give an extra measure of durability…no more fraying. Also, there are small but effective reflective inserts in the heels for a bit of nighttime visibility. That’s always a nice touch. The logos are fairly subtle, and the color combo is one of my favorites…black with red accents. I showed them to my friend David when he was visiting — he’s a longtime Chrome bag user and jokes that his black-and-red Metropolis bag was the inspiration for building up a black-and-red fixed gear bike…after all, the bike has to match the bag, right? Needless to say, he was quite envious. These shoes are understated, yet they catch people’s attention in a positive way. I received quite a few compliments on them. How do they ride? 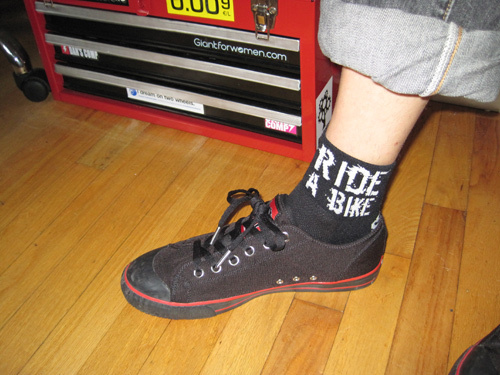 Quite nice, in fact — the stiffened sole eliminates the hot-spot issue many Converse/Vans/Adidas Samba wearers experience when riding with traditional cage pedals. One simply cannot feel the edges of the pedals digging in to the bottom of your foot with the Chromes on. And the shoes aren’t so stiff that they make walking uncomfortable — Chrome did their homework and found a good balance in that stiffness. 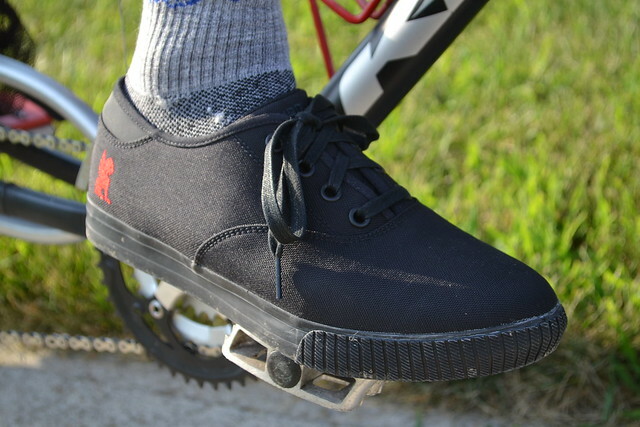 The sole is plenty sticky…perfect for platform pedals like the BMX models I favor, and the shoe’s overall profile lends itself to riding with toeclips, slipping easily in and out of the clips without hangups. Perhaps the only negative thing I can say about the Kursks is that they’re cut rather narrow. I have fairly bony feet and even I found the toebox a bit cramped. Unlike canvas shoes that will stretch with enough wear, the Cordura fabric of these shoes remains unyielding — that may change with more wear, but I’m doubting it. If you’ve got wide feet, you may consider purchasing a half-size larger than your normal shoes (they DO come in half-sizes from 4.5 to 11.5, with whole sizes in 12, 13 and 14). Or, you may want to find a place locally to try them on before pulling the trigger. These shoes have become my default “casual Friday” work shoes — they look great and they’re great to ride in. For $70.00, you’ll get a well-made and well-thought-out pair of shoes that will dazzle your friends. Thumbs up! Check out Chrome’s online store for these and other models of shoes, including the Saipan, the Arnhem and the Midway.